Marijuana and cancer—it’s a subject with growing interest around the country. Cancer is a topic with high emotional resistance, and rightfully so. Just in the United States, an estimated 1,762,450 cancers will be in diagnosed in 2019, which equates to more than 4,800 new cases each day. Cancer is the hallmark disease of modern society. There are few individuals that haven’t been touched by this complex family of diseases, from diagnosed friends and family to those who’ve battled cancer themselves. Those diagnosed are faced with few options when it comes to treatment and pain management: chemotherapy and radiation dominate, leading many to wonder if there are more natural methods to fighting back. In an era where the collective mood is changing towards cannabis, more individuals are curious about using marijuana for treatment and pain management. This guide offers information about marijuana and cannabis complete with patient resources to help you and your family through one of the most difficult times. The cannabis plant has been used in nearly every culture for centuries. In fact, cannabis is included in the 50 fundamental herbs within the cornucopia of Traditional Chinese Medicine. It has been used as a medicine for nearly 3,000 years and cited in ancient texts as having healing properties in over 100 ailments. Yet cannabis was removed from the U.S. Pharmacopeia in 1942 and continues to be classified as a Schedule I drug — high potential for abuse and no known medical use. However, oncologists — more than doctors in any other discipline — support the option of recommending cannabis as part of a treatment program for patients suffering from cancer. In a 2014 Medscape survey of roughly 1,500 doctors, researchers found that 56 percent supported legalizing medical cannabis at a federal level, with oncologists making up 82 percent of those in favor of cannabis. ***We don’t recommend or endorse therapies or practitioners from the resource list above. We’re not promoting anything except informed choice — something we believe every person with cancer should have. With the growing interest in cannabis for cancer, many people wonder if marijuana cures cancer. While much research is needed to answer this question, cannabis has been proven to be incredibly beneficial for the body. 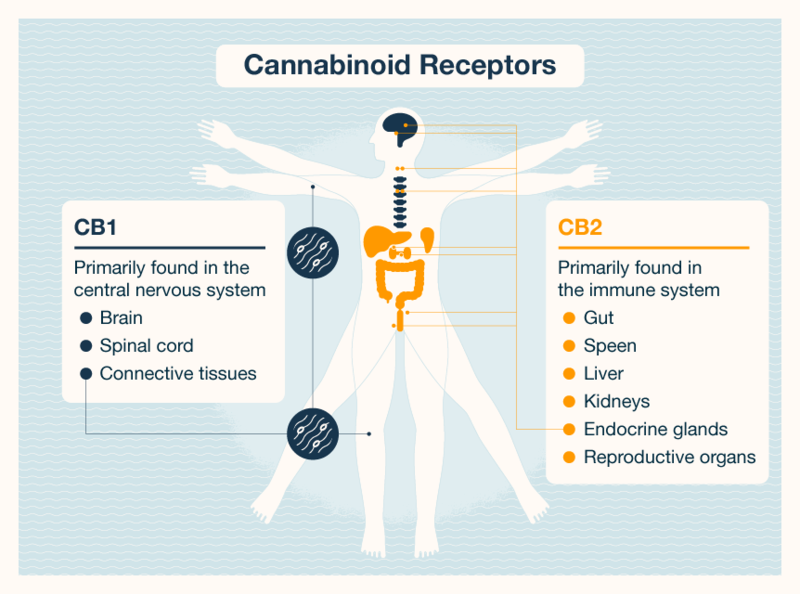 This section addresses how cannabis works in the body to provide healing properties. There are hundreds of chemical compounds in the cannabis plant that work together to provide relief from an array of symptoms. These compounds work by imitating those that our bodies produce naturally — they are called endocannabinoids. The endocannabinoid system (ECS) was discovered in the early 1990s and is responsible for regulating a wide array of bodily functions. Things like mood and immune function — as well as a variety of physiological and pathological conditions such as inflammation, analgesia and cancer — are regulated by the ECS. Promoting the death of cancerous cells. Arresting the initial growth phase of cells, thus preventing cancer cells from maturing. Reducing metastases — the spread of cancer cells — by cutting off blood vessels to cancerous cells. Cannabinoids found in cannabis plants hold many beneficial properties for the human body, which is why medical cannabis is commonly used in cancer patients to treat and manage painful symptoms of conventional treatments like chemotherapy and radiation. Medical marijuana is approved in many states as a supplemental treatment for cancer patients. That’s because cannabis is proven to relieve many uncomfortable and painful symptoms caused by cancer and its conventional treatments. Pain — Cannabis is most commonly used to treat individuals with cancer-related pain and can work similarly to opioids without the negative effects that come with pharmaceuticals. Marijuana is commonly known for its anti-inflammatory qualities that can help with pain. Neuropathy — Neuropathy is a medical term for nerve damage, which is a common complication of chemotherapy and other cancer treatments. It is typically characterized by a feeling of weakness, numbness, tingling or burning in the hands and feet. Medical marijuana has been shown to provide relief for those experiencing pain from neuropathy. Nausea and vomiting — One of the most widely studied therapeutic applications for cannabis and its pharmaceutical derivatives is for the treatment of nausea and vomiting associated with chemotherapy. Considerable evidence demonstrates that manipulation of the ECS through the consumption of cannabis regulates nausea and vomiting in both humans and animals. Cachexia — Cachexia (or wasting syndrome) is a phenomenon of unintentional weight loss, specifically the loss of lean muscle and fat. Cachexia is typically accompanied by fatigue and a decline in functional abilities. Some clinical and preclinical studies support the use of cannabis to manage pain, nausea, vomiting and appetite stimulation, thereby reducing the severity of cachexia in patients undergoing chemotherapy treatment. Several studies also show that THC is proven to be an appetite stimulant, which can be especially helpful for Cachexia. Depression and anxiety — Cancer patients often experience some of the most mentally and physically difficult times of their life during treatment. Consuming marijuana can help manage the feelings of depression which are commonly associated with a lack of dopamine. In a study published by Neuropharmacology, scientists found that THC acts on receptors in a region of the brain called the nucleus accumbens, which increases the release of the neurotransmitter dopamine — the pleasure hormone. Insomnia — Preliminary research suggests that cannabis may enhance the quality of sleep, specifically CBD, whereas THC may decrease the time it takes to fall asleep. Interestingly, synthetic cannabinoids, including nabilone and dronabinol, may have short-term benefits for sleep apnea due to impacts on serotonin. While marijuana is also thought to possess cancer-fighting abilities, clinical studies are limited because marijuana is still classified as an illegal substance by the federal government. Consequently, the federal government’s position on cannabis stifles much-needed research on cannabis as a “cure” for cancer. A CBD:THC ratio refers to the amount of both cannabinoid compounds present in any form of cannabis, such as flower, edibles or extracts. THC and CBD hold unique healing properties, but reach their full potential when combined together and with other compounds in the cannabis plant — also known as the “entourage effect.” The optimal ratio will vary depending on one’s individual physiology, medical conditions and cannabis tolerance. A ratio of equal parts CBD to THC (1:1) is considered highly effective for pain relief, anxiety, insomnia, nausea and appetite stimulation. An equal ratio may also be able to kill certain cancer cells and inhibit tumor growth. This is a good starting point for patients due to the multitude of conditions it may treat with minimal impairment. Some research has found that if you apply THC and CBD to cancer cells in the lab, the combination is more effective than applying THC alone. When used together, these cannabinoids are believed to exert a synergistic effect on reducing and inhibiting tumor growth. Whole plant medicine is extremely important when it comes to using cannabis for cancer treatment and pain management. The success of medical cannabis for relieving pain in cancer patients largely depends on the entourage effect. Search the internet for “cannabis and cancer” and you’ll find millions of web pages, making it difficult to sort through the information most applicable and valuable to your circumstance. 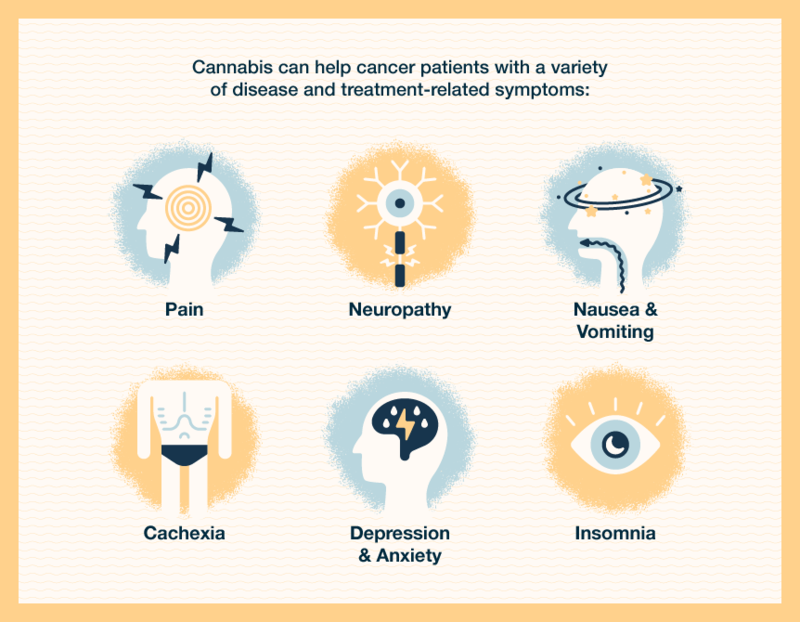 To help you-you analyze, find clarity and seek out true educational information, we’ve put together this list of resources for cancer patients who are considering cannabis as a form of treatment. Explore this collection of websites and pages for further guidance. While we’ve included a number of studies, books and organizational resources, those below are geared specifically towards cancer patients and their families. The United Patients Group is a trusted leader in medical cannabis for physicians, patients and organizations. UPG offers an excellent compendium of data for patients and professionals alike, acting as a virtual hand for patients by helping them navigate the cannabis industry. Patients Out of Time has been at work for more than 20 years and is considered the “granddaddy” of medical cannabis advocacy groups. This non-profit group includes information from members of professional health care organizations who have taken the lead in urging their organizations to formally support patient access to medical cannabis. They offer a robust library of cancer-specific resources and studies. Illegally Healed is a go-to site for patient testimonials and videos. They aim to produce engaging content related to cannabis science and medical cannabis news. Illegally Healed also offers a wealth of cancer-specific resources to educate their community about the full healing capabilities of cannabis. Medical Jane works to create patient-focused resources that offer trustworthy education, helpful guides and access to industry professionals. They also list a wealth of disease-specific information including research for several different forms of cancer. The Cannabis Patients Alliance is a Colorado-based patients group with many personal stories and resource materials. They’re widely known for participating in policy-making and cannabis advocacy and serve as a source for the press when issues arise that deal specifically with medical marijuana patients. Beyond Conventional Cancer Therapies is an organization that helps patients explore the best integrative approaches to cancer diagnosis and treatments that go beyond conventional cancer care. They review a wide range of integrative and complementary therapies, including cannabis for cancer by reporting known benefits, risks, side effects and other information to help patients make an informed choice. This page offers a comprehensive list of ailments. Search by ailment to find symptoms and/or side effects that can be treated or managed with medical marijuana. Cannabis is an ever-changing industry, so it’s important to stay up-to-date on the most recent laws and changes in legislation. This page is an excellent resource for which states have legal marijuana: both recreational and medical. In addition to the patient-specific resources above, this list includes organizations that may be useful to professionals, cancer patients and their families. This includes helpful resources for finding more information about cannabis research, clinicians and access. Cannabis is an ever-changing industry that can be difficult for cancer patients and their family to navigate — the legality of cannabis being one of the most common concerns. 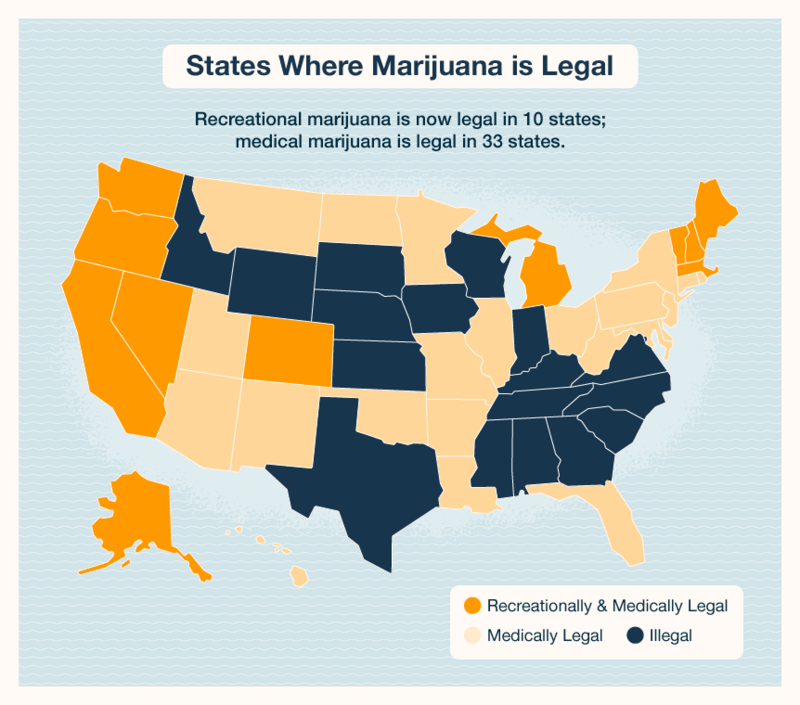 This map provides a visual guide of the states where marijuana is considered both recreationally and medically legal, only medically legal and illegal. Medical marijuana is approved in many states as a supplemental treatment for cancer patients, but it’s always important to stay up-to-date on your state’s current cannabis legislation. Be forthright. There is nothing wrong or illegal about discussing medical cannabis with your doctor, even if you live in a state where marijuana is not legal. The Supreme Court ruled that doctors may not be investigated, threatened or punished by federal regulators for recommending marijuana as a medical treatment for their patients. As a result, doctors are free to discuss medical marijuana as a treatment option with their patients. Many doctors are accustomed to patients bringing alternative ideas to them about treatment and preferences, so remember that medical cannabis should be no different. Use these tips below to make the conversation as smooth as possible. Do adequate research — Before approaching your doctor about medical marijuana, make sure you get informed about the ways cannabis can help your symptoms and how it could affect your condition. Be transparent — As we previously mentioned, there is nothing wrong or illegal with discussing medical cannabis for treatment. Being transparent is key to having a good relationship with your doctor and can help you make an educated decision. How do you plan to consume cannabis — Cannabis comes in many different forms, including flowers, edibles, tinctures, concentrates and more. Understand that each type has different effects on your health and mental state. Do you know of any studies on cannabis and my particular condition? Know when to seek other opinions — If your doctor doesn’t seem to be supportive about cannabis, still make sure to respect their professional opinion. You can always get a second opinion from another practitioner if you feel it’s necessary. 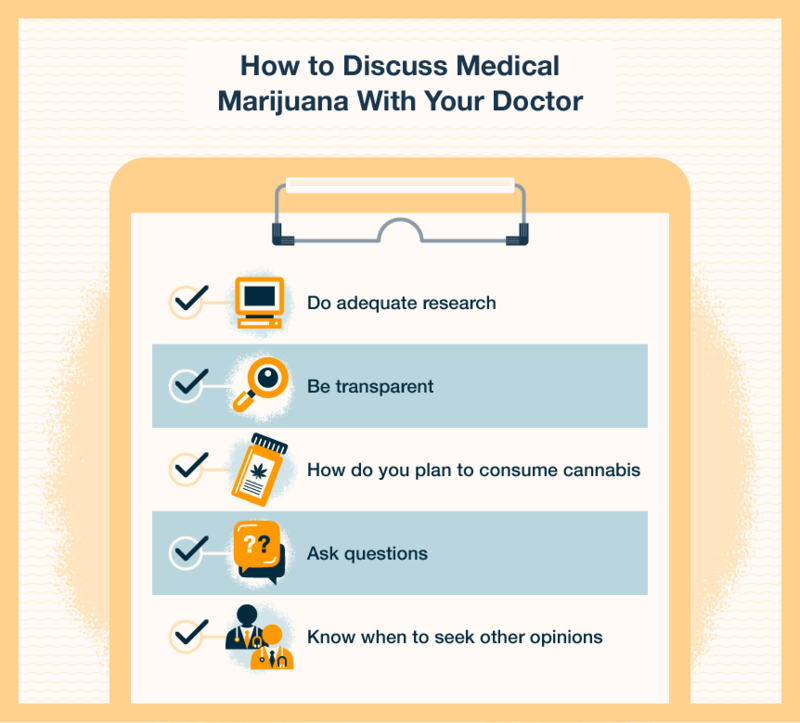 Talking to your doctor about medical marijuana isn’t always easy, but the public perception of cannabis is changing, which means that many doctors are becoming more open to discussing marijuana. Having this list handy can help make things easier when you discuss your options with your doctor. Medical marijuana is not covered by insurance, Medicare or Medicaid. THC and CBD are present in various levels in different strains of marijuana products. 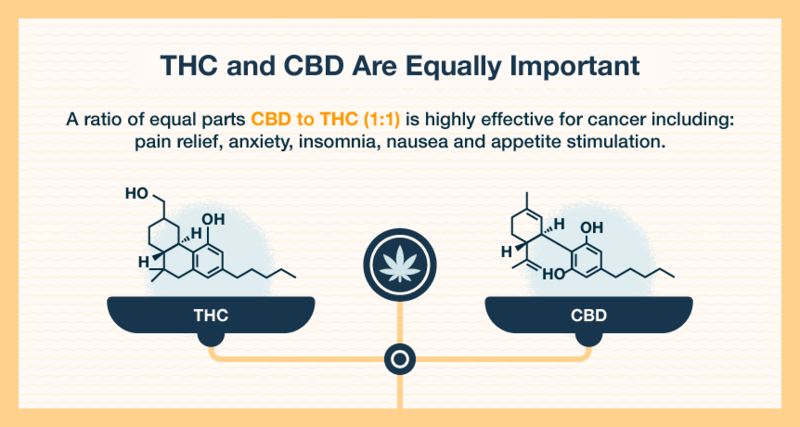 The ratio of CBD to THC matters. This can also take some trial and error to find what works best for your body. You may have to go to several dispensaries until you find one that you’re comfortable with. Consider visiting a medical dispensary over a recreational one since staff members may have more experience helping people with cancer. Before you go to a dispensary, it can help to write down the symptoms you would like to ease with medical marijuana. Describe your symptoms and what, if anything, has worked for relief. Have you tried medical marijuana before? If so, what was your reaction to it? If you work for the federal government or an employer that conducts regular drug tests, you may face disciplinary action for using medical marijuana. Always consult your employer’s medical marijuana policy before using it. Additionally, your state may have employer laws in place that protect you as a medical cannabis user. Because cannabis therapy is relatively new in the mainstream, a current challenge for many patients is the lack of regulation. Unfortunately, not all cannabis is created equal, which means it’s important that you do your due diligence to find quality products. Some legal states like California have a general framework for the regulation of commercial medicinal and adult-use cannabis, meaning that products you find in a dispensary meet state standards. However, there are several things you should consider when using marijuana as part of your cancer treatment program. Ensuring that you receive a quality product is of the utmost importance, so don’t be afraid to take your time inquiring about specific cannabis products with your local dispensary. There is a difference between recreational (adult-use) and medical dispensaries, so you may feel more comfortable visiting a dispensary specifically geared towards medical cannabis. Medical cannabis dispensaries are designed to give patients a secure location to procure information and cannabis grown to treat ailments. They’re usually regulated and taxed differently than recreational cannabis dispensaries. For this reason, prices of cannabis may vary. More research is needed to learn about the potential effects and limitations of cannabis-derived medicines for both adult and pediatric cancers. This lack of evidence is precisely the problem — and it’s exacerbated by the current federal regulations around medical marijuana. Clinical findings are limited because marijuana is still classified as an illegal substance by the federal government. Many people are advocating for the government to loosen restrictions on cannabis so more research can be done. On the horizon for medical marijuana is the Medical Marijuana Protections Through the Compassionate Access, Research Expansion and Respect States (CARERS) Act. This bill would end the conflict between state and federal medical cannabis laws. Under the CARERS Act, all state-legal medical cannabis conduct would be exempt from the Controlled Substances Act (CSA), delisting cannabidiol as a schedule 1 drug. It would also lift research burdens, allow banking services to medical cannabis businesses, and enable V.A. doctors to write medical cannabis recommendations for veterans living in states with medical cannabis programs. Navigating cancer treatment is difficult enough and shouldn’t be complicated by limited access to medical marijuana. We hope this guide helps shed some light on the wide array of resources for you to incorporate cannabis in your treatment routine. Before you decide to try medical marijuana as a supplement to your cancer treatment, do adequate research, seek additional opinions and talk with your oncologist to make sure it’s the right choice for you. 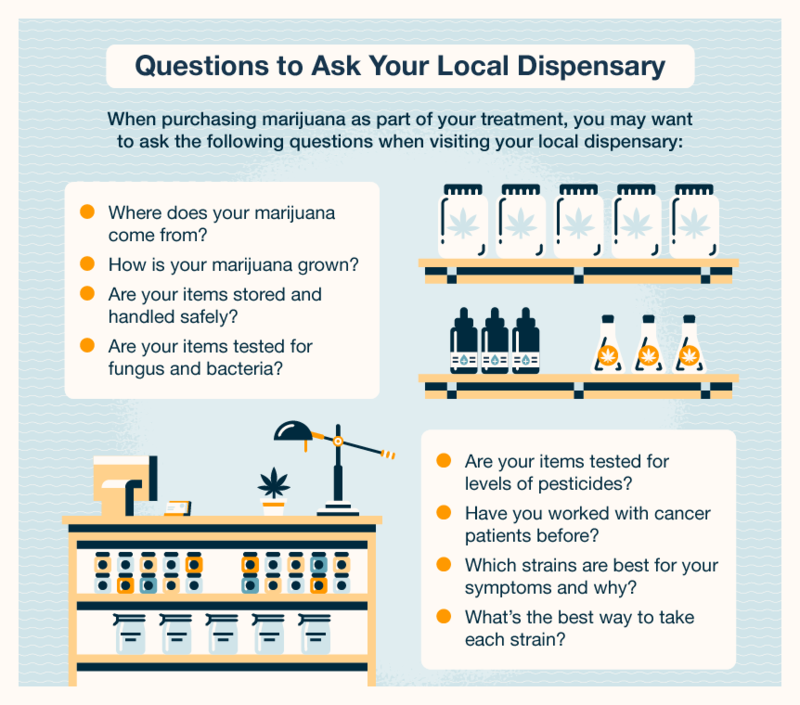 Learn more about how cannabis can help you with cancer treatment and symptom management by finding a medical marijuana doctor and dispensaries in your area.